The sexily tousled Horst Buchholz, whom I once had a childish crush on, featured briefly but significantly as a hot new thing in the 1960s. 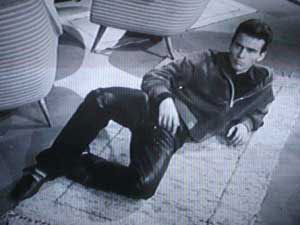 A kind of European James Dean with shades of Montogomery Clift, Buchholz had a certain intensity - a darkly brooding attractiveness that set him apart from the usual line-up of clean young Hollywood leading men: he also had great hair in a pre-gel era. Horst, whose family nickname was, appropriately, Hotte, first came to my (and the world's) attention in the 1959 British B thriller Tiger Bay, which co-starred a wide-eyed Hayley Mills, who was twelve at the time. Young for a leading lady but her charmingly innocent rapport with Buchholz was what elevated Tiger Bay above the regular run of-the-mill British B dramas of the era - that and the gritty back street realism that marked a shift toward British New Wave cinema. Hayley's role was originally intended for a boy but John Mills, who played a police superintendent in the film, suggested his daughter for the part - fortuitously, as she went on to win a BAFTA for Best Newcomer and was scooped up by Disney soon after. In his first major English-speaking role, Buchholz plays a possessive Polish sailor who returns to an unfaithful, mocking woman and in a classic crime passioniel shoots the ungrateful wench in the stomach, while Hayley Mills sees all through a keyhole. The mid-century histrionics can be enjoyed in the scene below, which also stars a forty-four year old Yvonne Mitchell as the femme fatale. Hard to believe she'd be giving Hotte the flick...but maybe that's just me. Born inconveniently in 1933, at a time of European turmoil, German born Buchholz, the son of a shoemaker, had his childhood interrupted by WWII and wound up in foster homes in Silesia and Czechoslovakia for a time, before returning to his native Berlin and launching into an acting career at the keen age of sixteen. Although he had appeared successfully in several films in the German Cinema in the 1950s, where he was something of an idol (and often typecast as a rebellious teenager), internationally, the 60's was the real boom time for Buchholz and he followed the success of Tiger Bay with the role of Chico, the Mexican gunfighter in the 1960 John Sturges epic, The Magnificent Seven and the following year scored the romantic lead in Joshua Logan's Fanny, where he starred alongside Maurice Chevalier and Leslie Caron. The actors. 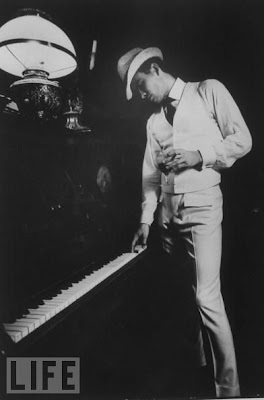 husky, exotically accented voice, distinctive looks and somewhat fraught performances which hinted at a sexily smouldering personality beneath the surface, were for a time in demand. Yet somehow, in star terms, longevity eluded him and as the 60s progressed, safer US grown box attractions like Paul Newman, Robert Redford and Steve McQueen were leaving the edgy Buchholz in their wake. Alas, in the 70s, the meaty roles dried up almost entirely and Horst was cast adrift in a series of mediocre television gigs, although he still managed to score the odd decent part in European films, and appeared in his last significant role in 1997, playing a puzzle-obsessed doctor in Robert Benigni's Oscar winning Life is Beautiful. Although Horst had been married, to French actress Myriam Bru and had two children, Christopher and Beatrice, like his contemporary, Tab Hunter, in later years he spoke openly of his bi-sexuality. According to his son Christopher, who made a documentary, Horst Buchholz: My Papa, his parent's marriage went rapidly pear shaped when Horst ran off for a time with a male secretary. There were, said Christopher, "missing pieces" in his father's life, though what that means is unclear. Buchholz, who once described actors as being like whores allegedly refused to work with certain directors, including Robert Wise, Elia Kazan and Louis Visconti, for what has been described as 'dubious reasons' but if true, one would've thought decisions like that couldn't have been a good career move. 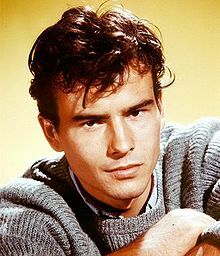 Horst Buchholz died of pneumonia in 2003, in his home town of Berlin, after complications from a fall and he was buried there, eternally attached to his place of birth. He was sixty-nine.